Coming up with an eye catching, evocative new label each year is far more of a creative challenge than you may imagine. How best to capture the very essence of the wine? That is the spirit of a vintage which is about to be launched into the big wide world after 18 months of coddling at the foot of the hillside on which the grapes were grown. We've meddled around with clip art and photoshopped family pictures (remember the first and so far, the favorite Papa Grappa?) and even toyed with the idea of something other than a traditional graphic, but all roads have led us to the stunning original artwork of our friend and Petaluma artist/graphic designer, Rob Neidel. Rob has very graciously collaborated with us on the bold new label for our just released 2006 Petaluma Hills Cool Climate Petaluma Gap grown Que Syra. When I say just released, that doesn't mean this fruit forward, full-on pepper berry beauty is about to appear any time soon on the shelves at Vine and Barrel. 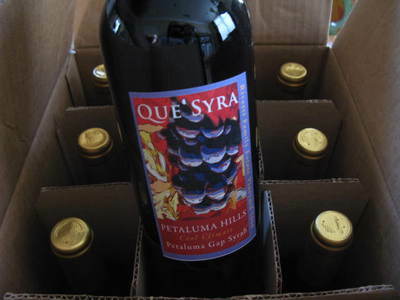 With production just a tad under commercial requirements, Petaluma Hills Que Syra remains in the hobby winemaker's category for this year's round of wine country award competitions. Timo has high hopes for the 2006 as he enters into the prestigious Sonoma Marin Fair, Sonoma Harvest Fair and Marin County Fair Amateur Syrah competitions. For this year's private release packs a punch with a luscious, leathery, spicy sensuality and smoother tannins than in previous years. And with Rob's gorgeous grape art on our label, who will be able to resist a taste? Based right here in West Petaluma, Rob (a major fine wine aficionado and proprietor of the awesome underground Squid) has access to the best vineyards in Sonoma County to conjure his artistic magic on canvas each Fall. 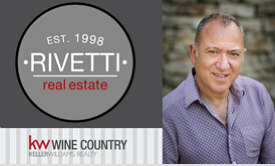 We fully expect to see his fabulous work gracing many more Petaluma Gap Grape and Wine Alliance labels in the future. I ran into the vintner himself yesterday as he scoured the community in search of the best method of label reproduction. The labels are gorgeous! A wonderful face to what looks to be a fantastic product, once again. Best of luck! New wine labels look suitably stylish for what I hope is a fabulous vintage. Need to check it out in person ideally, to test at least 12 samples. Just in case. International house guests do get free run of the wine cellar........as long as they promise not to slide down the banister after a bottle or two!